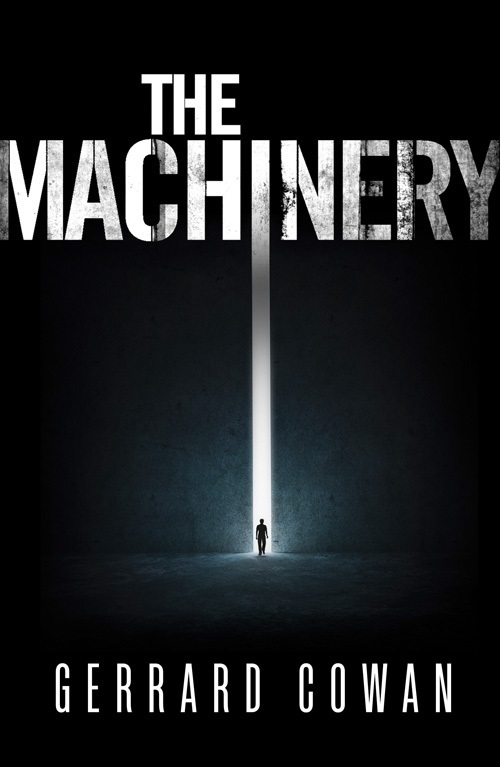 The Machinery will be published on September 10th, so one month from today – I can’t believe it! To mark the occasion, here is the first chapter. I hope you enjoy! I am breaking, the Machinery said. Alexander had not heard it for days. It sounded different tonight: like a child. Alexander looked to the window. His sister was below, playing with marbles in the courtyard. I’ll try to speak to father again tonight. He knew he would be called a liar. But there was no other choice; he had to make them understand. The boy turned to face Amile, and started over again. ‘On the third day, the tribe gathered on the Primary Hill, to be entertained by the madman. ‘“This is when all shall change,” the madman said. But the people did not believe him, and laughed in their ignorance. ‘“You will be punished,” said one. Alexander paused, and looked to the ceiling. There was nothing there. Ruin will come with the One. You know who it is. Alexander looked once more to the window. Clack, clack, clack, went the marbles. ‘The people laughed again. “If he told you all this, Arandel – where is he?” Arandel dropped the stone and looked to the sky. ‘In the centre of the ground, at the peak of the hill, ten paces from where they sat, a fire had started to burn, as if of its own accord. ‘“What witchcraft is this?” But their talking ceased, for they had seen something in the fire. A man stepped forth from the blaze, his cloak burning with flames of its own, dark and cold. The people wept, for they saw in this cloak the reflections of their own souls. ‘And so the tribe received the Machinery, the power of the Underland. It would choose the greatest leaders of the Overland, its Tacticians and Strategists, from now until the end of time, be they bakers or butchers, merchants or artists, boys or girls, men or women. And thus, the Overland would grow under their wisdom, to become the envy of all the great Plateau. ‘The Machinery knows,’ said Alexander. And I know the Machinery. Before Alexander was a red velvet curtain, fastened by a golden knot. The boy stood still for a moment, wondering if he had been noticed. Sucking in a breath, Alexander pushed through. The study was an airy, spherical, stone-walled space, its ceiling formed of thick clear glass that could be winched open at points to allow the entry of cooling airs. It was night, now; starlight illumined everything. This room, unlike its counterparts in other parts of the dreary mansion, was in constant flux. Perhaps it reflected the mind and travels of Jaco Paprissi, Alexander’s father, the head of the Paprissi Financial House and lord of the manor. Jaco and his men were the only Overlanders allowed to sail from the Plateau, and he had just returned from his most recent voyage. Items were still being unpacked from the wooden chests that filled the great courtyard, the most interesting or curious gravitating upwards to this study where they could be examined more closely. Alexander drank it in: on the second shelf to his left, a wooden statue depicted a man and a woman locked in primitive combat; above this, a row of silver instruments, like finely wrought blades; and on the floor to his right, a bronze representation of some kind of war machine, what appeared to be a trebuchet lined with cannon, rolling forward of its own accord. In the centre of the room was a brass contraption, a long thick tube covered in golden letters in some foreign tongue. At the bottom of the tube was an eyepiece, into which Jaco peered. He turned to the boy and grinned. Jaco left his new toy and walked to his son, putting a hand on his shoulder and smiling down at him. It is coming. The voice had grown weaker. I’ll tell him, thought the boy. I’ll tell him. But he was afraid. Why should he believe me this time? ‘The Machinery knows,’ his father echoed, before leaping to his feet and returning to his lettered tube. Alexander hesitated before taking the plunge. Jaco stopped dead, his hands falling to his side. Silence fell on the study. The elder Paprissi leaned down and put his eye to the telescope. The Great Hall covered the entire southern section of the ground floor of Paprissi House. It was one of the oldest surviving parts of the building, its stone walls the remnants of an ancient keep: a place of faded nooks and crannies, dark snugs and cubbyholes. The summer light was fading as Alexander entered, casting shadows that darkened the aspects of the Paprissi forebears staring blankly down at their young descendant. Alexander sat with his legs crossed in the middle of the cold stone floor, just next to the dining table, swinging a thin piece of white parchment through the air in a kind of sporadic dance. This strange, private little ceremony helped unleash his imagination. He was transported to other realms: to flaming battles on open plains; to dynastic struggles with Doubter kings; to the ruins of ancient cities, heavy with sorcery. Here, he could control events. Here, he did not feel like a plaything of a voice. The boy’s gaze floated to the Operator shrine, at the back of the hall. It had been there for as long as the hall itself, a grey statue on a black chair, proud and solemn. The sculptors of the Middle Period were renowned for the subtlety of their work, Amile had told Alexander; hence the fine detail of the wrinkled face, the perfect smoothness of the bald head, the laughing wisdom of the eyes. The cloak, though, was the symbol of the Operator; it had been refreshed in more recent years by one of the new artists of the Centre, and the talent of this master shone through, from the strange swirls of purple and black to the hints of faces in the ether. Alexander swung round. The voice seemed closer now, more urgent, as if the speaker was behind him. There was no one there. I can do nothing. He turned back to the statue. There was someone in its place. He – it – regarded Alexander thoughtfully, steadily rapping the arm of his dark throne with his sharp fingers. He was filth itself: his mangy skin red with scabs, his grey tongue flickering at the sides of his mouth. A torn gown billowed out onto the floor around him, coating the flagstones like oil on water, its colours in perpetual motion like the sky in a summer thunderstorm. The faces were ghosts in a silken prison. The voice echoed of another world. A time before the Machinery. Alexander steeled himself. Somehow, he always had known that this would happen. He leaned forward in his throne, placing his head in his hands. The Operator was on his feet in an instant, and loomed over Alexander. The faces in his cloak cringed, afraid of their master. The boy did not answer. He looked hopefully at the door, but no one was coming for him. Was his grandmother outside, sitting in her old chair? There was a pattering of rain on the windows. The Operator shook his head. ‘No. No, that is not what it told you. But I will find the truth.’ He glided over to Alexander’s side and wrapped a long arm around the boy’s shoulder. ‘We will go to the Underland. You will be happier there. Yes, oh yes. We will be able to study your broken brain.’ Alexander snatched a quick look at a jagged smile; he willed himself to resist, but something had encircled and taken power over him, and he could do nothing but follow the strange creature to the window. The Operator gathered him in his arms, smiled, and leapt into the rain of the night. They seemed to fall slowly, like feathers in the breeze. The authority that had been exerted over the boy allowed no room for fear. There was no need to scream, it assured him, no need to cry out or fight back. We are floating, not falling. As he fell, he looked up and saw a face at the window: a girl gazing down at him; a girl with round black eyes and long black hair; a girl with marbles in her hands. But then Alexander Paprissi was gone forever: gone below the earth. Well I’m sucked in! Bring on September 10th! Next Next post: Top ten reasons to buy ‘The Machinery’!